Marina Loshak’s soon-to-be inauguration as director of the Pushkin State Museum of Fine Arts on July 10 signals that modernization is just around the corner for one of Russia’s most important pieces of cultural heritage. For many in Russia, Marina Loshak’s appointment to replace Irina Antonova, who had headed the Pushkin State Museum of Fine Arts for more than half a century, is more than a mere reshuffle. It means that modernization has spread to museums—one of the most conservative spheres of public life. Although Marina Loshak has, in interview after interview, assured that she is not going to make any “museum revolutions,” it is obvious that changes are inevitable. If not for any other reason, imminent changes can be assumed from the simple fact that Loshak, born in 1955, is a representative of a totally different generation and artistic environment from those of her predecessor. Marina Loshak, born in Odessa on November 22, 1955, is a chief curator, art expert, dealer, collector and manager, as well as one of the most prominent specialists in Russian avant-garde art. 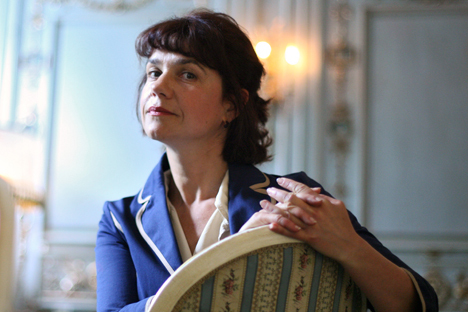 Starting July 1, 2013, she will become the new director of the Pushkin State Museum of Fine Arts. In 1998, Loshak was head of the SBS-Agro Bank PR service, served as the bank’s cultural attaché and was later (1999–2003) director of the Moscow Arts Center on Neglinnaya Street (also owned by the bank at that time). She is currently a co-owner of the Brocade vintage clothing boutique and an avid collector of naïve art and headwear. In 2007, Loshak helped found the Proun Gallery, which she co-owned and directed. In 2012–2013, she served as the art director of the Moscow Manege Museum and Exhibition Center. Marina Loshak is a member of the expert council for the Kandinsky Prize. By trade, Loshak is a philologist rather than an art expert, and her CV mostly includes literary and avant-garde art projects. She previously worked at the Odessa Literary Museum and the avant-garde-orientated State Museum of Mayakovsky in Moscow. In addition, she has curated Russian avant-garde exhibitions for the Moscow Art Center. Loshak’s last position was director of the Moscow Manege Museum and Exhibition Center, which is also a large museum space located at the heart of Moscow—not quite on the Pushkin Museum’s scale, though. The Pushkin is part of Russia’s cultural heritage, on a par with the Bolshoi and the Hermitage. One task Loshak has set herself is to bring the Pushkin Museum into line with modern, Western standards. “A modern approach sometimes involves a certain language culture rather than radical change—thanks to very simple things, such as light or navigation. Some things you just cannot do without these days, such as Wi-Fi. It’s possible to start moving forward with some basic steps. In general, museums must speak a modern language: Look at how we don’t speak Old Slavonic anymore. Information flows are very fast in Moscow, and staying up to date is essential,” said the new director. In fact, it is not all that simple, and mere technical innovations are clearly not enough. The museum’s expansion is long overdue. Essentially, it lacks space to exhibit the art stored in its vaults. The same goes for the construction of a so-called museum village on Volkhonka Street: The British architect Norman Foster’s design has yet to be realized. On this, Loshak’s stance is little short of revolutionary. While she has no specific execution ideas, she has a vision of what the end result should look like: “I like the idea of open storage. It’s like windows without curtains in Holland. Russians love shutters and fences. Our mission is to remove them all”. “This construction is our common task. We have to expand expert boards, to develop a broader look at things than from just the museum perspective. I have very high hopes for cooperation with the city government, whose activities I hold in extremely high regard. I think the city has a bigger stake in it than anyone else. Not only should parks become places where people can feel at ease, but also museums should become places where people can feel free. The museum should become a cozy place where people would want to come and stay: The atmosphere needs to be friendly,” Loshak said. But Marina Loshak has long since earned a reputation as a liberal, which, in the art world, means maximum openness and democratic views. It would be fair to expect a lot of modern art exhibitions at the Pushkin Museum, following the hiatus they have taken in recent years. Of course, Loshak’s liberalism and modern views play a role, but not only that: Modern art is what she really knows and likes to curate. Irina Antonova was born on March 20, 1922, in Moscow. She is a fine art expert and has served as director (1961–2013) and president (starting July 1, 2013) of the Pushkin State Museum of Fine Arts. During World War II, she trained as a nurse and worked as a Medical Corps corporal, starting in the spring of 1942 at a hospital in the Moscow district of Krasnaya Presnya. In 1945, she graduated from Moscow State University and, after joining the staff of the Pushkin State Museum, continued her studies at its graduate school, focusing on Italian Renaissance art. Irina Antonova has inspired and organized a number of big international exhibitions, including “Moscow–Paris,” “Moscow–Berlin,” “Russia–Italy,” “Modigliani,” “Turner,” “Picasso,” etc. Irina Antonova has written over a hundred published materials (catalogues, articles, albums, TV programs and documentary screenplays). She has taught fine arts at Moscow State University, the S. Gerasimov Russian State University of Cinematography and at the National Institute of Eastern Languages and Civilizations (Paris). Antonova has been a member of the Civic Chamber of the Russian Federation since 2011. In 2012, Irina Antonova endorsed Vladimir Putin in his presidential campaign. While there are no specific construction plans yet, there is a stance: “First thing we do, we will create a totally transparent information system to exclude any secrets or misunderstandings surrounding such a serious construction project.” Openness and transparency are also hallmarks of a liberal approach and a new, modern way of thinking. In addition, this is an excellent PR move. In fact, Loshak has solid expertise in the field, having headed the PR department of SBS-Agro Bank in the past. There is no doubt that the Pushkin Museum’s public relations will change soon after she assumes office. They have actually changed already. As soon as Loshak’s name emerged as the successor to Antonova, the Pushkin State Museum of Fine Arts was transformed from an academic subject into quite a modern one. One of the museum’s most painful experiences has been its recent spat with the Hermitage over demands that some of the latter’s collections be transferred to Moscow. At stake is the re-opening of the Museum of New Western Art, which shut down years ago. At the time, the unique collection of Impressionists and Modernists was split between the Pushkin Museum in Moscow and the Hermitage in St. Petersburg. Now that plans for re-opening the museum have emerged, the nation’s westernmost and most respected museum, the Hermitage, is refusing to part with its portion of the collection. In interviews with the Russian media, Loshak has cautiously supported the idea of uniting the collection in a new museum, while making it clear that the decision had to be made “above the museum level”—i.e., by the government. Loshak’s appointment has caused a public reaction that is rare in the museum sphere. Some are predicting a strengthening of state influence in this area, while others are talking about an inevitable liberalization of the stale academic world of museums and a legitimization of modern art at the official level. Mikhail Shvydkoi, Special Representative of the Russian President for International Cultural Cooperation and former culture minister also commented recent changes: “I think the Ministry of Culture made the right choice in appointing Marina Loshak, because the Pushkin State Museum has always been more about events than collections. It has always played a huge part in the country’s cultural life, because Antonova was so good at contriving events. She has courage, too—not everybody knows when to step down. One thing is clear though: Russian art is up for some serious changes come July 10, 2013. The Pushkin State Museum of Fine Arts (formerly the Alexander III Museum of Fine Arts at the Imperial Moscow University) has one of the largest and most prominent Russian collections of European and foreign art. The museum opened on May 13, 1912. The exhibition area of the museum is 28,761 square feet, and its depository is 25,445 square feet. Originally, it was founded as part of Moscow State University’s Fine Arts and Antiques Office, as a depository of casts and copies of classical art pieces used for training and exhibition purposes. When the World War II, most of the Dresden City Art Gallery, along with Priam's Treasure discovered by Heinrich Schliemann, was brought to the Pushkin State Museum. Later, the Dresden collection was returned to East Germany, but certain valuable items brought from West German museums and private collections remain in Moscow.